Our Dublin office has been a little quieter than usual this week as we’ve been clocking up the airmiles with trips to the US and Belgium. Our founder & CEO, Parsa, has been stateside meeting customers and speaking at both the Re-Work Deep Learning Summit in Boston and Text by the Bay in San Francisco. Parsa was introducing byte2vec: a flexible embedding model constructed from bytes. More on that to follow! On Tuesday our VP of Sales & Marketing, Mike Waldron, visited our European neighbours Belgium to attend the Language Technology Industry Summit, organized by LT-Innovate, and to proudly accept their annual award distinguishing “The Best in Language Technology”. to articulate the Industry’s collective interests vis-à-vis buyers, researchers, investors and policy makers. The LT Industry Summit is the yearly point of convergence between the Language Technology Industry, its clients, research partners and policy makers. Day 1 kicked off on Tuesday with a welcoming message from Philippe Wacker, secretary general of LT-Innovate. The discussions throughout the day ranged from project war stories from the likes of SDL and Phillips to product showcases from startups and Machine Translation (MT) giants. Topics focused around MT challenges, the rebirth of AI and language technologies in healthcare. Day 2 is still in full flow taking a slightly different approach in having longer sessions which are split into two separate tracks. Text Analytics has featured heavily today and there are more technology showcases lined up for this afternoon following a great discussion on the challenges of multilingual media publishing. The award is given at the annual Language Technology Industry Summit in Brussels and we were thrilled to attend in 2016 as proud winners. Receiving an award like this is a fantastic compliment for the excellent work our brilliant engineers and researchers do everyday. It’s amazing to be recognized by some of the leading Language Technology professionals in Europe for the work we do in the NLP space. We’d like to extend our thanks to the LT-Innovate board for considering our work at AYLIEN to be among the best in Language Technology. We’re excited about continuing our relationship with the LT-Innovate team and returning to the summit next year. Wanna try our award-winning API’s? 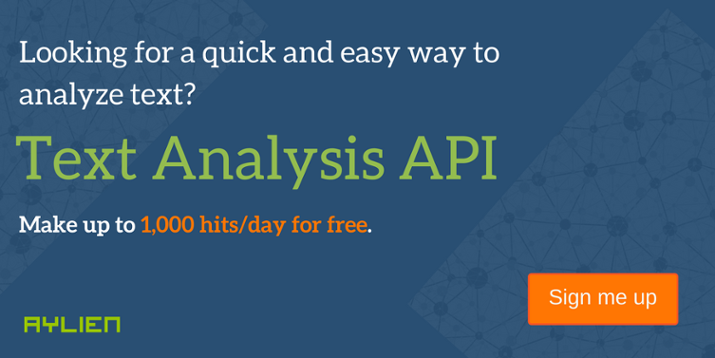 Click the image below for FREE access to our Text Analysis API or check out our recently released News API.